Vietnam always attaches importance to the friendship and all-round cooperation with the United Arab Emirates (UAE) – one of its leading partners in trade, investment and labour in the Middle East, said National Assembly Chairwoman Nguyen Thi Kim Ngan. The top Vietnamese legislator made the statement at a meeting with Sheikha Lubna Khalid Al Qasimi, Minister of State for Tolerance of the UAE, in Abu Dhabi on December 12 as part of her activities in the country to attend the 11th Global Summit of Women Speakers of Parliament. NA Chairwoman congratulated the host on her election as the UAE’s Minister of State for Tolerance, saying that the appointment shows the country’s determination to improve the life quality and satisfaction of the people, and promote tolerance – a basic value that is highly valued in the UAE. While expressing her admiration at socio-economic achievements the UAE has made in recent time, as well as her delight at increasingly developing ties between the two countries. She appreciated the organisation of the Summit, stressing that the event will contribute to improving the role and position of the UAE in the region and the world at large. The guest also briefed the host on the Vietnamese NA’s duties, hoping that the two countries will share their experience in law-making and implementing policies to create social interests and better people’s living conditions. 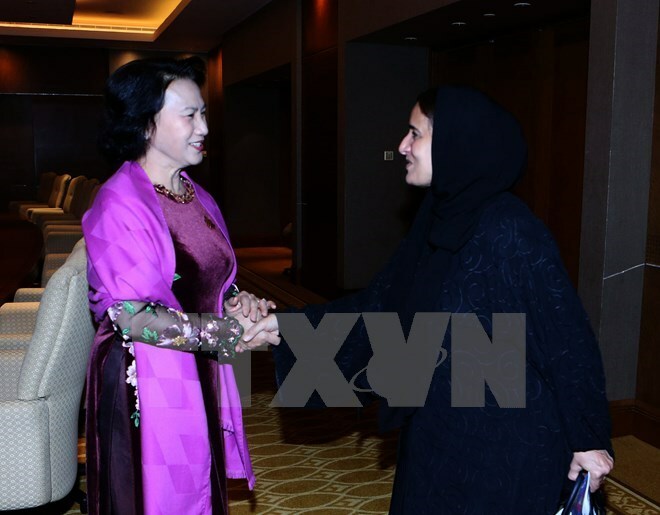 She expressed her belief that Sheikha Lubna Khalid Al Qasimi will work to further promote the Vietnam-UAE cooperation in the coming time. For her part, the UAE official said that the establishment of her agency is to protect the UAE’s values, adding that her country’s policy on tolerance aims to promote tolerance and prevent extremism in the society. Sharing views with the host, NA Chairwoman Ngan also highlighted the spirit of tolerance in Vietnam’s policies. She said that in its foreign policy, Vietnam plans to wrap up the past and look toward the future and wants to be a friend with all countries around the world. Regarding social policies, the country often gives clemency to prisoners and all religions in Vietnam are equal before the law, she added.